Marinate the meat with flour, sesame oil, soya sauce & pepper for about 1 hour. Heat up the wok with oil and sautéed the ginger, garlic and onions. Add in the chicken meat and stir-fry for about 1-2 mins then add in the mushrooms and paprika. Add in oyster sauce and sugar to taste. Add in the flour liquid a little at a time to desired texture and stir in the spring onions. 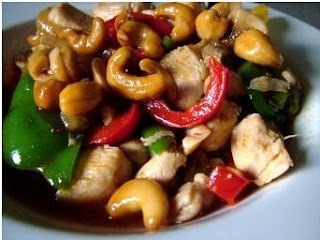 Sprinkle the cashew nuts, dish up and it is ready to be served with steamed rice.